Men of the Nigerian Security and Civil Defence Corps (NSCDC) on Tuesday arrested a Methodist Reverend, Mr Chuka Egwuonwu, for allegedly extorting N126,000 from candidates to aid malpractices. Mr Patrick Ukpan, Commandant, NSCDC, FCT Command, while presenting the suspect to newsmen in Abuja, said the suspect who owns a CBT centre called Diamond ICT Centre was arrested in Abia State. Ukpan said that the arrest was made possible through the help of CCTV mounted in the centre and controlled from the Abuja headquarters of the JAMB. “It was observed that they were extorting money from candidates. The centre have extorted about N126,000. “Each candidate was asked to pay N1,000 for what we do not know but this is a criminal act. “Based on that, he was arrested; JAMB examination that is being conducted now has camera and live transmission of activities are taking place there straight to the headquarters of JAMB. “Whatever activities are taking place at the centres are being monitored live and based on those monitoring devices that they we were able to corroborate their intelligence regarding the extortion of money. He added that the corps would continue its investigation to get to the route of the alleged crime, adding that other collaborators would also be arrested if there are any. In his response, Egwuonwu admitted that some coordinators collected money from the students but found out in his investigations that the act was committed outside his centre. The suspect said those who extorted the money from the candidates were not his staff. Also, Mr Fabian Benjamin, Head of Media, JAMB, said there was a link between the suspect’s centre and the tutorial centre that extorted money from candidates. Benjamin, who recalled an incidence of protest by some centres in Lagos demanding the extension of registration till May, said the tutorial centres were there to extort the students which informed their protest. “These centres want to have enough time for the registration of JAMB so as to have enough time to extort the students,” he said. He said the arrest had confirmed the board’s suspicious that the tutorial centres were after exploitation. 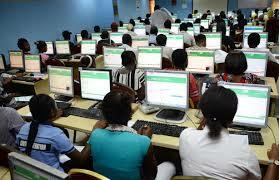 The JAMB spokesman added that the tutorial centres were damaging the integrity of education in the country.